Our Bath wedding venue overlooks the Limpley Stoke Valleys and offers breath-taking countryside views. 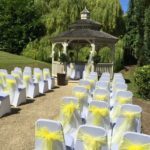 The beautiful views can be seen from all angles of our venue, from the outside Terrace area, the Gazebo and from our elegant function rooms inside the hotel. Located in a quintessential village, which is on the outskirts of Bath. At our Bath wedding venue you experience the countryside along with the Romance of Bath – without the hustle and bustle of the city. Despite our Bath venue being set in a quiet countryside village, there is plenty of space for your guests. Our traditional Georgian hotel will accommodate for your individual needs. Catering for small or large weddings, our hotel offers a variety of elegant function rooms. Accommodating small weddings from just 40 guests, or larger ceremonies, accommodating for up to 120. The build up to one of the most important days in your life will bring a mixture of emotions. A our Bath wedding venue there is no need to worry about the noise distractions of the city. Our countryside hotel is peaceful and will ensure you get a comfortable nights sleep before your big day. We even have a Four Poster bridal suite to make the night that extra bit special. Finding the venue that matches the visions of your special day is important. Our Bath wedding venue is bound to impress the moment you look at it. 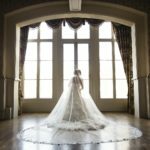 If it’s a traditional, grand venue in the countryside that you’re looking for, then our Georgian hotel near Bath is perfect for your special day. Not only is the outside of the hotel impressive, the moment you and your guests step into the venue you will be wowed. 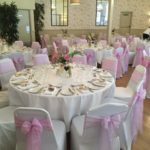 Our Bath wedding venue offers elegant and spacious function rooms and excellent banqueting facilities. For a charming countryside wedding venue, The Limpley Stoke Hotel is perfect for you. Book a viewing here or call 01225 723333 for wedding enquires.